Pedro of Chelsea looks on. N'Golo Kante showed off the better side of his game after midweek criticism by his coach to inspire Chelsea to a 2-0 win over west London neighbor Fulham in the Premier League on Sunday. Ruben Loftus-Cheek added a second goal in the 82nd minute after impressive build-up play by Eden Hazard. Chelsea coach Maurizio Sarri said during the week that Kante has yet to settle in his new, more attacking role this season and was critical of the midfielder's display in last weekend's sobering 3-1 loss at Tottenham, Chelsea's only defeat in the league so far. Kante is widely regarded as the best holding midfielder in the world but is no longer playing there for Chelsea since the offseason arrival of deep-lying Italy playmaker Jorginho. His ability to press high up the field in his new position and spark counterattacks, which was the route to Chelsea's opening goal, perhaps explains why Sarri is keen to play Kante there - and will continue to do so this season. Chelsea inflicted its former coach Claudio Ranieri's first loss since he took charge of last-place Fulham last month. Ranieri had started his tenure with a home win over Southampton last weekend. With Tottenham losing 4-2 at Arsenal later Sunday, Chelsea moved back up to third place. "Today was about the result - we gave more attention to the defensive phase to get the win," Sarri told Sky Sports. "Now we have to start to improve and play our football in a better way." "We needed to kill the match before (we did)," Sarri added. "But I think today we were a little bit tense." There are signs that Ranieri, who led Leicester to an improbable Premier League title triumph in the 2015-16 season, is getting some shape back to Fulham's team and the visitors had decent chances against Chelsea, with Calum Chambers twice testing goalkeeper Kepa Arrizabalaga early in the second half. "It's strange to say," Ranieri said, "but I think we played much better today than in the Southampton match. "At the beginning we gave a good present when we lost the ball and they scored on the counterattack, but afterwards we reacted very well. When you concede a goal from the beginning, it's difficult." Chelsea moved back to within seven points of first-place Manchester City, with the teams meeting at Stamford Bridge next weekend. 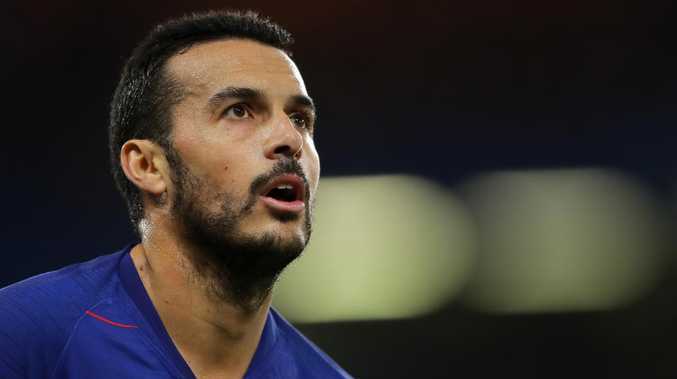 Pedro's goal was Chelsea's 1,000th in the Premier League, making it the third team to reach that landmark after Manchester United and Arsenal.